Did you know we have a MASSIVE range of dredges and marlin gear in store?? Yes, we have one of the best locations to target billfish, with one of the best equipped stores in the country. Did you know we stock Pelagic Youth Shirts?? They are $25 and perfect for those youngsters who love to get in to their fishing. We also stock Pelagic Youth Shorts. Buy in store today or call us to see what we have in our great range. Want to see our store? Click here for a tour inside. Our customer service is our priority. Our price is always competitive- just ask us today. 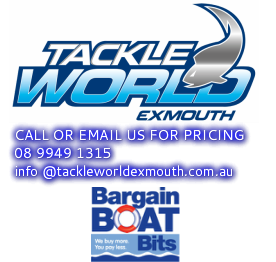 Tackle World Exmouth is a family business, operated by Matt and Jeni Gates for the last 22years. Come in and meet our friendly, helpful staff, who are always willing to share their wealth of local knowledge and fishing tips. Their prices are very competitive and their local advice is bounded by many years experience combined from all the crew. Staff members Ross, Kevin, Scott, Jake, Maarit, Darren, Paul, Aaron and Barry are avid anglers that regularly fish from the shore and boats. They are more than happy to give you that helpful advice, no matter what you are chasing. Plus up to 50% off selected shirts and other gear in store. Matt Gates has been building rods for over 20years and can build you a personalised rod for anything. Matt has specialised is GT sticks, marlin rods and barra rods after many years of targeting these species and learning what works best. In 2016, renowned rod builder Barry Taylor joined the Exmouth team. Barry and Matt began working together at Bluewater Scarborough many many moons ago in the rod building room. There are great reasons to choose Tackle World Exmouth for your next custom built rod. 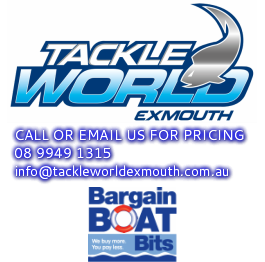 Tackle World Exmouth is proudly a part of the Tackle World group of almost 50 stores nationwide. All stores are focused on helping anglers get the most enjoyment out of their fishing and watersports. The enthusiastic staff are passionate about their recreational fishing and outdoor activities. Exmouth is increasingly becoming known as the gamefishing capital of Western Australia. It has also become a mecca for fly fishing anglers. Common species such as bream, flathead, norwest snapper, queenfish, trevally, dart, cod and northern salmon can also be caught regularly from the shore. Although the town is only small with a population of around 2000 people, the fishing is big, with over 40 gamefish species on offer including 6 species of billfish. Not to mention succulent table fish such as coral trout, red emperor and yellowfin tuna to name a few. There are also many other options for a fresh feed of seafood in Exmouth, including prawns, squid, blue swimmer crabs, mud crabs and five species of rock lobster. Owners Matt and Jeni Gates have written for various fishing magazines and appeared on several television programs for fishing. Matt and Jeni are involved in many community programs to help encourage people to learn about the benefits of recreational fishing. Matt Gates is highly known for his quality custom rod building. 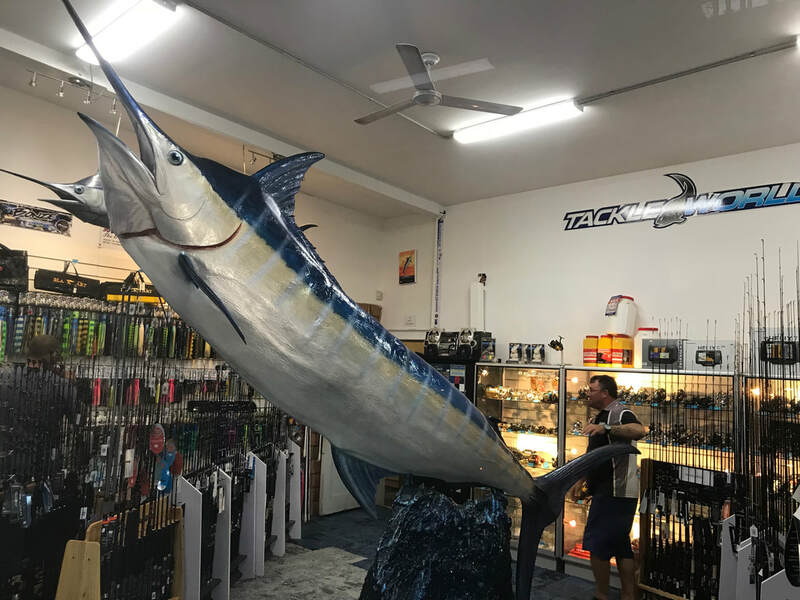 If you’re after a heavy duty spin rod to tackle the giant trevally, or personalised trolling rod for marlin, or perhaps need a fine barramundi outfit, Matt can create you one of his masterpieces. Jeni is one to take out the girls and often fishes in tournaments with an all-female team. (No men allowed onboard...?!) Jen especially enjoys helping people catch their first billfish.